← Insert or Update Record in SQL Server Depending on Whether it Already Exists. 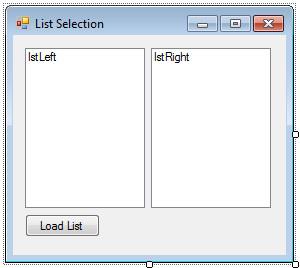 This example shows how you can move items between two listboxes by double-clicking on the items. To start you need a form, with two listboxes (I labelled mine lstLeft and lstRight). I also added a button (btnList with the caption “Load List”) to populate lstLeft with some items to play with (and reset the form). So, in design view my form looks like the one below. So we have cleared both lists, and added several items to lstLeft. Firstly we check to make sure an item has been selected in the list, by checking the SelectedIndex > -1. 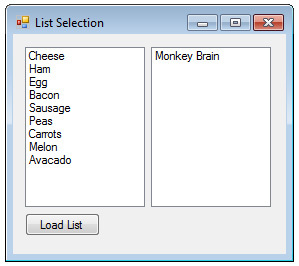 We then add the selected item to the other list and remove the selected item from the double-clicked list. Now you should find that when you click the button lstLeft is populated and lstRight is cleared, and if you double-click an item in lstLeft it moves to lstRight and vice versa! This entry was posted in Programming and tagged c sharp, c#, listbox, programming. Bookmark the permalink.